» How to add a password to protect your Word 2016 document? How to add a password to protect your Word 2016 document? If the document that you are authoring contains sensitive information, then you might want to protect it to ensure your work’s integrity by allowing only designated people to view and modify its contents. There are several ways to protect a document, today we’ll focus on the ones i found typically more useful. In essence, this means that you have completed writing the document, including incorporation of suggestions and comments from your colleagues. You are NOT preventing others from viewing or modifying your document. From the Info tab, hit Protect Document. Save your documents to your PC, OneDrive or shared network location. This technique allows you to encrypt the contents of the file and set a password protection, so only the relevant individuals will be able to access your documents. When setting a password protection, it is advised to keep your password safe location. 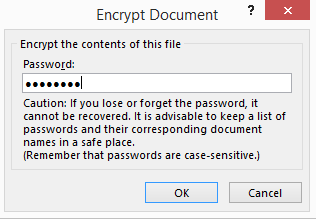 Enter your protection password and hit OK.
Word will now encrypt your file. Note that the procedure for encrypting PowerPoint presentations and Excel spreadsheets is very much similar.